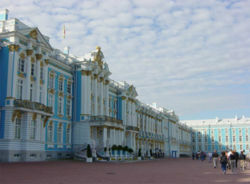 Rococo developed first in the decorative arts and interior design. Louis XV's succession brought a change in the court artists and general artistic fashion. By the end of the old king's reign, rich Baroque designs were giving way to lighter elements with more curves and natural patterns. These elements are evident in the architectural designs of Nicolas Pineau. During the Régence, court life moved away from Versailles and this artistic change became well established, first in the royal palace and then throughout French high society. The delicacy and playfulness of Rococo designs is often seen as a reaction to the excesses of Louis XIV's regime. The 1730s represented the height of Rococo development in France. 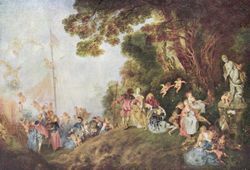 The style had spread beyond architecture and furniture to painting and sculpture, exemplified by the works of Antoine Watteau and François Boucher. Rococo still maintained the Baroque taste for complex forms and intricate patterns. By this point, it had begun to integrate a variety of diverse characteristics, including a taste for Oriental designs and asymmetric compositions. The Rococo style spread with French artists and engraved publications. It was readily received in the Catholic parts of Germany, Bohemia, and Austria, where it was merged with the lively German Baroque traditions. 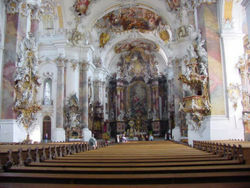 Particularly in the south, German Rococo was applied with enthusiasm to churches and palaces. Architects often draped their interiors in clouds of fluffy white stucco. 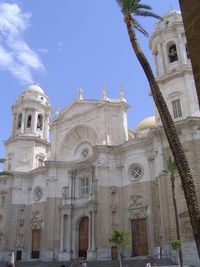 In Italy, the late Baroque styles of Borromini and Guarini set the tone for Rococo in Turin, Venice, Naples and Sicily, while the arts in Tuscany and Rome remained more wedded to Baroque. Rococo in England was always thought of as the "French taste." The architectural stylings never caught on, though silverwork, porcelain, and silks were strongly influenced by the continental style. 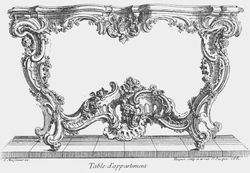 Thomas Chippendale transformed English furniture design through his adaptation and refinement of the style. William Hogarth helped develop a theoretical foundation for Rococo beauty. Though not intentionally referencing the movement, he argued in his Analysis of Beauty (1753) that the undulating lines and S-curves prominent in Rococo were the basis for grace and beauty in art or nature (unlike the straight line or the circle in Classicism). The development of Rococo in England is considered to had been connected with the revival of interest in Gothic architecture early in the 18th century. The beginning of the end for Rococo came in the early 1760s as figures like Voltaire and Jacques-François Blondel began to voice their criticism of the superficiality and degeneracy of the art. Blondel decried the "ridiculous jumble of shells, dragons, reeds, palm-trees and plants" in contemporary interiors . By 1780, Rococo had passed out of fashion in France, replaced by the order and seriousness of Neoclassical artists like Jacques Louis David. It remained popular in the provinces and in Italy, until the second phase of neoclassicism, "Empire style," arrived with Napoleonic governments and swept Rococo away. The lighthearted themes and intricate designs of Rococo presented themselves best on a smaller scale than the imposing Baroque architecture and sculpture. It is not surprising, then, that French Rococo art was at home indoors. Metalwork, porcelain figures, and especially furniture rose to new pre-eminence as the French upper classes sought to outfit their homes in the now fashionable style. 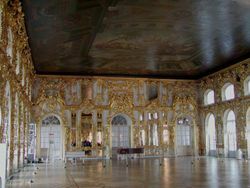 Rococo style took pleasure in asymmetry, a taste that was new to European style. This practice of leaving elements unbalanced for effect is called contraste. This wall clock on its bracket, a well-known design by Charles Cressent is in a gilt-brass case filled with "contraste" in its details. Its theme: "Love conquers Time," with a Cupid atop the clockcase and Time with his scythe, collapsed below. For small plastic figures of gypsum, clay, biscuit, porcelain ( Sèvres, Meissen), the gay Rococo is not unsuitable; in wood, iron, and royal metal, it has created some valuable works. However, confessionals, pulpits, altars, and even facades lead ever more into the territory of the architectonic, which does not easily combine with the curves of Rococo, the light and the petty, with forms whose whence and wherefore baffle inquiry. Dynasties of Parisian ébénistes, some of them German-born, developed a style of surfaces curved in three dimensions (bombé), where matched veneers ( marquetry temporarily being in eclipse) or vernis martin japanning was effortlessly completed by gilt-bronze ("ormolu") mounts: Antoine Gaudreau, Charles Cressent, Jean-Pierre Latz, François Oeben, Bernard II van Risenbergh are the outstanding names. 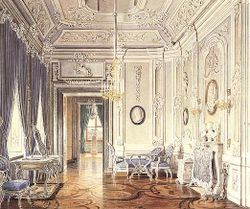 In those Continental contexts where Rococo is fully in control, sportive, fantastic, and sculptured forms are expressed with abstract ornament using flaming, leafy or shell-like textures in asymmetrical sweeps and flourishes and broken curves; intimate Rococo interiors suppress architectonic divisions of architrave, frieze and cornice for the picturesque, the curious, and the whimsical, expressed in plastic materials like carved wood and above all stucco. Walls, ceiling, furniture, and works of metal and porcelain present a unified ensemble. The Rococo palette is softer and paler than the rich primary colors and dark tonalities favored in Baroque tastes. Jean-Antoine Watteau ( 1684– 1721) is generally considered the first great Rococo painter. He had a great influence on later painters, including François Boucher ( 1703– 1770) and Jean-Honoré Fragonard ( 1732– 1806), two masters of the late period. Even Thomas Gainsborough's ( 1727– 1788) delicate touch and sensitivity are reflective of the Rococo spirit. Sculpture was another area that Rococo artists branched into. Étienne-Maurice Falconet ( 1716– 1791) is widely considered one of the best representatives of French Rococo. In general, this style was best expressed through delicate porcelain sculpture rather than imposing marble statues. Falconet himself was director of a famous porcelain factory at Sèvres. The themes of love and gaiety were reflected in sculpture, as were elements of nature, curving lines and asymmetry. 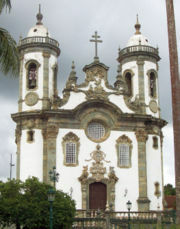 Hints of Rococo can be discerned in the churches by the Brazilian master Aleijadinho. In the church Rococo may at times have the charm of prettiness and may please by its ingenious technic, provided the objects be small and subordinate a credence table with cruets and plate, a vase, a choir desk, lamps, key and lock, railings or balustrade, do not too boldly challenge the eye, and fulfill all the requirements of mere beauty of form.